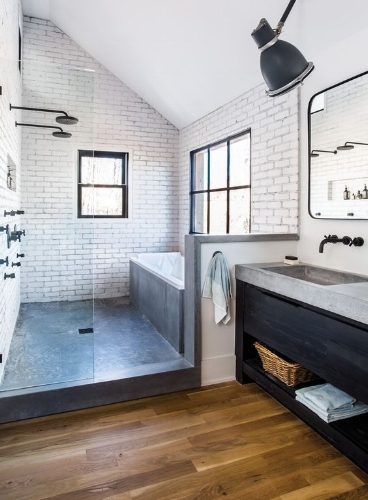 When I think of a master bedroom, I think of a nice big bathroom with a double-headed walk-in shower, a soaker tub (even though I'm not a bath person) and lots of storage for all my stuff. Unfortunately, our master bathroom does not have a lot of storage space and the "soaker tub" is a bisque colored 1978 shower tub combo that's so dark and closed in you get claustrophobic taking a shower. And it's surrounded by hallways and a stairwell so there's really no way to make the space bigger. Our bathroom is a galley shape with a double vanity in one "room" and a toilet and shower tub combo in another very small "room". The door into the toilet shower room has long been removed because it served no purpose since it would skim the toilet when you open and closed it. Here's a shot of our current bathroom. Gag. So my solution? Keep the color palette neutral, clean and bold. And of course, tear down a wall. The wall between the two "rooms" will come down to open up the space and the shower door will be clear glass to make the space appear larger and more open. The color palette will be black and white. 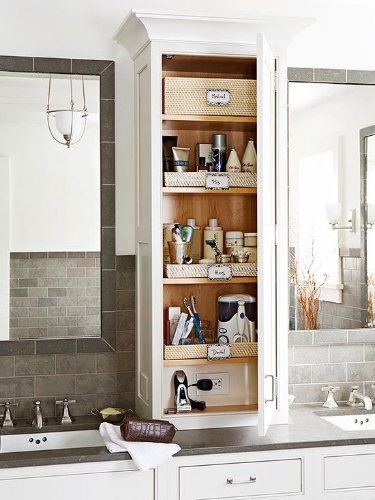 The new double vanity with shaker style cabinets will be white with a marble-looking countertop and my favorite part, a tower between the two sinks for storage like the one below. All the hardware will be oil rubbed bronze to match the bold black marble-looking tile floor. I went with black tile and gray grout for a bold contrast against the white vanity and because I like the look of it (we have it in our laundry room) and gray grout doesn't show dirt like lighter grout. We got rid of the tub because I don't take baths and a walk-in shower is much more luxurious looking. And with a clear glass door, it make the space appear bigger and less claustrophobic. 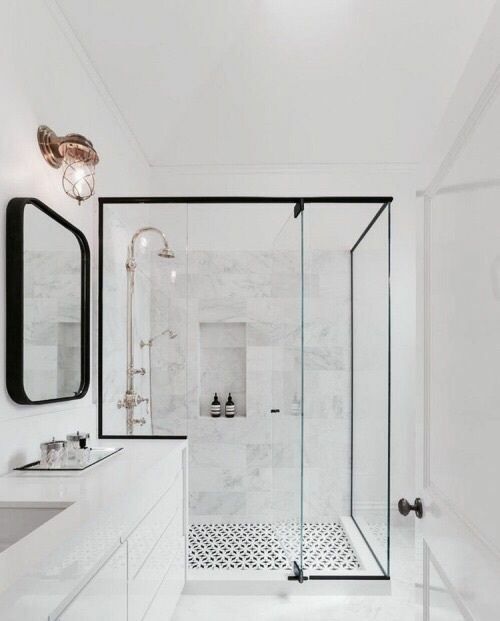 I carried the black floor into the shower with black hex tiles and then contrasted with oversized marble-looking white subway tiles on the three shower walls. For the shower floor, I used the mosaic tiles because they work much better as a shower floor since they are more pliable for grading a floor towards the drain.